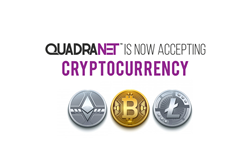 QuadraNet Inc., a nationwide full-service data center provider has announced that it is officially accepting cryptocurrency (namely Bitcoin, Litecoin, and Ethereum) payments for its services as of March 2018. “We are proud to take another step towards simplifying things for our clients by adding cryptocurrency transactions to our company’s arsenal as requested by many on our social media platforms." Ilan Mishan, Co-Founder & CEO, QuadraNet, Inc.
QuadraNet Inc., a nationwide full-service data center provider, has announced that it is officially accepting cryptocurrency (namely Bitcoin, Litecoin, and Ethereum) payments for its services as of March 2018. Cryptocurrencies, along with their blockchain technology, have greatly penetrated into our society and are showing no signs of holding back from excavating its existence in the world of finance today as people consistently look to invest in them. Therefore, QuadraNet Inc., along with its great reputation in data center related solutions, identifies now as the right time to put its consumers’ cryptocurrencies to good use by launching the new cryptocurrency payment method. QuadraNet Inc. previously accepted PayPal, credit cards, wire transfer, checks, Alipay, and Tencent WeChat Pay as a mode of payment for all of its services. By adding the new cryptocurrency payment method to their lineup, they have taken a step further in making it easy for clients around the world to utilize and access their services. QuadraNet, Inc. is a full-service data center provider headquartered in Los Angeles, California. Their data center locations include the cities of Los Angeles, Dallas, Miami, Atlanta, Chicago, and New Jersey.